Tracy has swam three of the Oceans Seven, the toughest oceans in the world and was the first person to swim an ice mile in the Netherlands in 3.6 degrees water. No wetsuit, just a swim costume, swim cap and googles. 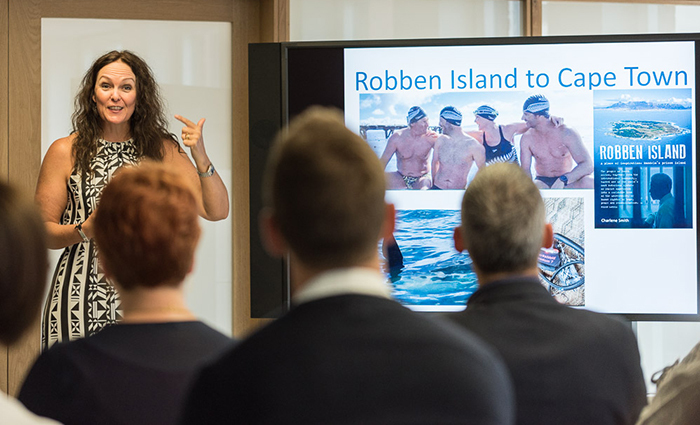 Tracy may be talking about swimming but she believes that everything she has achieved is about mindset, which applies to anything in life and business. Tracy had not been near a pool and definitely not a beach, because of a deep fear of sharks for 20 years before swimming the English Channel in 2013. She’ll share this journey, the swims, what she came up against both physically and mentally and how she overcame the challenges. Completing these swims are of course physical - but your state of mind is 90% of whether you will make it or not. In August 2016, she swam around Manhattan Island, New York and then took on the final four of the Oceans Seven. Only 6 people in the world have achieved all seven – “why not me?” says Tracy.